The fight for survival gameplay seen in the new SSX trailers, is just one gameplay mode, says the game's creative director. If the subtitle of the new SSX game - Deadly Descent - had you wondering if the series had abandoned the fun of previous games in favor of something dark and gritty, then you can breathe a sigh of relief. 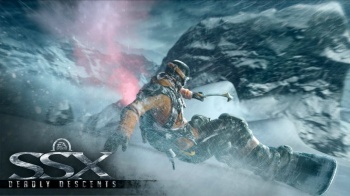 EA has dropped the rather ominous sounding subtitle, and assured fans that the new game will contain all the over-the-top SSX action they know and love. According to Todd Batty, the game's creative director, the "Deadly Descent" is just one of three gameplay modes that the new game, now called just SSX, will contain. Batty said that EA's core statement for the game had always been "survive it, race it, trick it," and tricks and racing were just as much a part of the game as harrowing mountain survival. "... I've always thought racing was the core of SSX," he said. "And we didn't want to go away from that, so we're going to have Speed Descent events, and of course we'll have tricks in our Tricky Descent events. We wanted to make sure we hit the over-the-top arcadey gameplay in all of these different gameplay modes. We decided to lead with the new Deadly Descent gameplay in that trailer, but all of the classic SSX style will be there, too. Batty said that the tricks portion of the game had received a significant overhaul as well. Not only were the courses a lot more open than they'd been in previous games, which gave more opportunities to throw your boarder into the air, the underlying physics of tricks had been updated as well. "[W]e work very closely with the Fight Night Round 4 team," he said. "Which has one of the most advanced physics systems possible, so we took the underlying code in their system and put it in our game to augment the trick system." "We want players to be able to ride off anywhere, at anytime, and vault into the air at ridiculous speeds and heights, and we want players to be able to flip and spin and roll on any axis to create an infinite amount of tricks. Then we layer in all the grabs, kick flips, and all the other over-the-top tricks that SSX is famous for." He added. The new, less deadly SSX is scheduled for release early next year.